As a contractor, there are many costs to consider. Owning or renting the equipment for a job can be hard on the pocket book. We’re not just talking about the tools for your project – you also have to dispose of any waste leftover once the projects done. Using a pickup truck is one solution, but you can’t get a lot of material in the back of a truck and that means plenty of trips to the dump. Even if you have a trailer, it still doesn’t give you much to work with. These issues alone are enough justification to consider a dumpster rental, but there are others a contractor should consider. 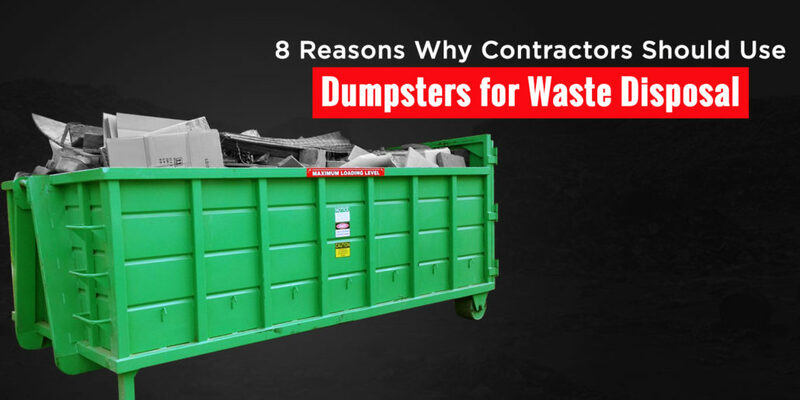 Here are 8 reasons we’ve identified why contractors should use a dumpster for waste disposal. When you rent a dumpster, it’s much easier to keep the owners property clean. That’s important. After all, they did hire you to improve their property so leaving a mess behind isn’t a good way to get a referral. When you rent a dumpster, many dumpster companies will place boards underneath them to prevent scratches or gouges. It’s also easier to safely dispose of material in a large dumpster. When you use a pickup truck, even one with a trailer attached, there is usually a bit of spillage. That can make a mess of the property you’re there to improve. When you use a dumpster, it’s a much bigger target for a more efficient disposal. Using a dumpster for waste removal is also convenient. You don’t have to worry about the waste removal from site. All you have to do is make a quick phone call to your local dumpster supplier when the bin’s full or when the job is done and the bin is taken away for you. That allows you to concentrate on what you do best, instead of secondary tasks such as waste removal. The more equipment you own the more red tape you have to cut through to make your business work. That trailer has to be registered and it has to be maintained. Opting to rent a dumpster instead reduces the need to deal with bureaucracy and the rental company insures the bin so that’s another thing you don’t have to worry about. There aren’t too many business owners that enjoy dealing with paperwork so renting a dumpster is another way to reduce this burden. Renting a dumpster also allows you to be more productive. If your company’s laborers are running back and forth to the dump all day long they won’t get as much done as they could. When you rent a dumpster, you don’t have to worry about all those trips. The laborers can stay on site making sure it’s clean and safe. That makes for a much more productive job site. When you use a small container such as a trailer attached to a pickup truck for waste removal there’s a good chance that there will be some spillage as we’ve already mentioned. It’s not uncommon for nails and other sharp debris to find their way to the ground. That can damage vehicles using the site and, in the case of a residential job, it will probably result in an angry homeowner if they find themselves with a flat tire because of a messy jobsite. If the reason you haven’t considered a dumpster in the past is because you don’t want to have to wait to get the job started don’t let that stop you. Look for a dumpster provider that can offer same day dumpster delivery service. Companies that can flip you a trash container in the same day means they efficiently manage their inventory and can get you a container when you need it; even on very short notice. A dumpster can hold a lot of waste – sizes range from your basic 4-yard dumpster all the way up to a 40-yard behemoth. There’s a right option for every job. 10 yard dumpsters are ideal for roofing projects and 20 yard dumpsters are ideal for kitchen remodels. When you choose the right size you’ll have all the waste disposal space you need right there on the job. For contractors, once the final nail is hammered in, it should signify the end of a remodeling or construction project; waste disposal shouldn’t be a concern. Renting a dumpster for your project site is the most efficient and cost effective option to remove waste from the job site.